When humans began to contemplate heavier-than-air flight, it was only natural to emulate birds. However, the complications of an ornithopter—using flapping wings to achieve flight—proved to be insurmountable. By 1900, most aviation pioneers focused their efforts on propellers and fixed wings; however, some persisted with the ornithopter. Drawings from René Riout’s US patent of 1911. 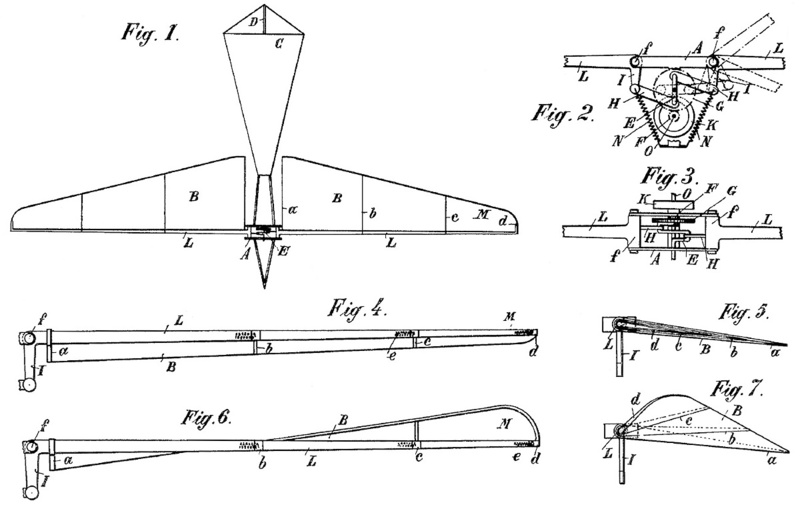 Fig 1 shows the ornithopter design, which had a passing similarity to the aircraft built in 1913. Fig 2 and Fig 3 show the wing flapping mechanism. Fig 4 and Fig 5 show the wing in a gliding position. Fig 6 and Fig 7 show the wing warped for thrust. In the early 1900s, French engineer René Louis Riout shifted his focus from automobiles to aviation. Initially, Riout designed models of gliders and propeller-driven aircraft, but his attention soon turned to ornithopters. By 1907, Riout was successfully flying his model ornithopter designs. In 1909, one of Riout’s models flew 164 ft (50 m) at an altitude of 10 ft (3 m). In 1910, his ornithopter model was flying 558 ft (170 m), and the distance expanded to 722 ft (220 m) in 1911. In late 1910, Riout was granted French patent 419,140 for his flapping wing mechanism and ornithopter design. The same invention was patented in Great Britain (191117951) and the United States (1,009,692) in 1911. Riout’s patent described how power from an engine was geared at a reduced speed to a crankshaft. The crankshaft had two crankpins that were positioned 180 degrees apart. A connecting rod linked each crankpin to the pivoting mechanism of one wing. As the crankshaft turned and the crankpin moved to the horizontal position nearest the wing, the wing was moved to its highest position. As the crankpin moved to the horizontal position farthest from the wing, the wing moved to its lowest position. Thus, the up and down movement of the wing was controlled by the speed of the engine. The drive system incorporated a heavy flywheel to smooth out power pulses from the engine. For small aircraft, a heavy spring could be substituted for the flywheel. Front view of the DuBois-Riout ornithopter with the three-cylinder Viale engine. The engine cylinders can be seen protruding above the cowling. The wings are positioned around 20 degrees above horizontal. Note the quarter-turn belt drive for the wheel axle. The patent details how the wings would warp as they moved. The upstroke was made in a neutral, gliding position. On the downstroke, the wing’s trailing edge would deflect up to provide thrust. Springs in the wing regulated the warp to match the power of the downstroke. A slow downstroke would result in the wing maintaining its glide form. The warp of the wing was greatest at the tip, tapering to very little warp at the root. By 1913, Riout had partnered with Jean Marie DuBois, and a full-scale ornithopter was built. Exactly what role DuBois played in the creation of the ornithopter has not been found, but the resulting machine was known as the DuBois-Riout monoplane. The DuBois-Riout ornithopter had a slender, streamlined airframe that was made from tubular-steel and covered in fabric. A vertical stabilizer with a rudder protruded from below the fuselage. A horizontal stabilizer extended to the sides from the top of the fuselage and incorporated an elevator. The single-place cockpit was positioned between the ornithopter’s wings. The wings had a tubular-steel frame and were fabric-covered. The aircraft was supported by taildragger landing gear. The ornithopter’s wings in the down position were about 20 degrees below horizontal, which was enough to make them contact the ground. This is why wing flapping would only be initiated after the aircraft was airborne, having been propelled to takeoff speed by the wheels. A shroud can be seen covering the top part of the drive belt. The ornithopter was powered by a three-cylinder Viale Type A engine. The three cylinders were spaced 65 degrees apart in a fan configuration. The air-cooled engine had a 4.13 in (105 mm) bore and a 5.12 in (130 mm) stroke. Its total displacement was 206 cu in (3.4 L), and it produced 35 hp (26 kW) at 1,500 rpm. The engine was positioned in the nose of the ornithopter and encased in a cowling, but its cylinders protruded into the air stream for cooling. The engine drove a crankshaft to flap the wings, just like the patent described. A major problem facing ornithopter designs was how to start the takeoff roll and gain enough forward speed to achieve flight. Via a belt, the DuBois-Riout used engine power to drive the main wheels during the takeoff run. The drive pulley was positioned behind the engine, and the follower pulley was positioned on the main wheels’ axle and perpendicular to the drive pulley. The follower pulley was offset to the left so that its front edge was directly below the left side of the drive pulley. As the belt came off the rear of the follower, it traveled to the right to reconnect with the right side of the drive pulley. The belt twisting 90 degrees enabled the longitudinal rotation of the engine’s crankshaft to be converted to transverse rotation for the aircraft’s wheels. Once the ornithopter was up to speed, the machine was glided off the ground. Via clutches, engine power was transferred from the pulley to the flapping wings for sustained flight. The DuBois-Riout ornithopter had a 34 ft 5 in (10.5 m) wingspan and a predicted max speed of 84 mph (135 km/h). The machine weighed 794 lb (360 kg). Side view of the DuBois-Riout ornithopter illustrates the vertical stabilizer under the fuselage and the elongated horizontal stabilizer. Note the large pulley on the wheel’s axle. In late 1913 or early 1914, Riout initiated tests of the ornithopter but encountered issues with the engine. It is not clear if the engine was not running correctly or if more power was needed. Before the issues were resolved, Riout left to serve in World War I. In 1916, Riout was granted permission to restart tests on the ornithopter. A 50 hp (37 kW) Gnome-Rhône engine was acquired and installed in the aircraft. No information has been found as to what modifications were made to the ornithopter to handle the rotary engine or its gyroscopic torque. Reportedly, the ornithopter made it into the air but quickly came down hard and was wrecked. No one was injured in the mishap, but Riout needed to return to the war, and no further work was done on the ornithopter. One might think that with the destruction of the DuBois-Riout machine and conventional aircraft proving their worth throughout World War I, Riout would move away from the ornithopter design. However, he persisted, but 20 years passed before his next ornithopter, the Riout 102T Alérion, was built. The ornithopter’s rudder can be seen in this rear view. Note the large control wheel in the cockpit and the fabric gap between the wings and fuselage. This entry was posted in Aircraft, Through World War I on 5 November 2017 by William Pearce.